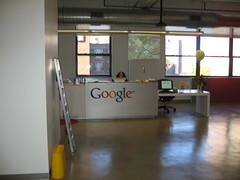 Yesterday, Google announced they closed on the purchase of the New York office they have been leasing since 2006. I visited the Google New York office shortly after it was open. The place was still a ghost town with barely anyone there when I toured the office. As I came back time and time again, the office filled and the last time I was there, it was awkwardly uncomfortable in terms of the number of employees stuffed into the office. Google's solution? Buy the place and take over more space that way. Today, were pleased to announce that weve closed a deal with the partnership of Taconic Investment Partners, Jamestown Properties and the New York State Common Retirement Fund to purchase 111 Eighth Avenue (also known as 76 Ninth Avenue). As part of the deal, weve retained Taconic Management Company to continue the leasing oversight services and management of the building on our behalf, providing the same level of customer service the buildings tenants have come to expect. We believe that this is a great real estate investment in a thriving neighborhood and a fantastic city. Good move? I suspect so. Heh, Google, can I rent some space from you?